Stewart Stevenson, SNP MSP for Banffshire & Buchan Coast, has welcomed new figures that show that the NHS in Scotland treated more people than ever before from October to December 2014. In NHS Grampian, the total number of inpatient and day case discharges in acute specialities has gone up from 34,386 in December 2013 to 35,741 in December 2014. Across Scotland, inpatient and day case discharges in acute specialities rose by around 5000 during the last quarter of 2014 to around 395,000 – the highest number of hospital discharges on record. “NHS staff in Scotland are one of our best assets and these figures show that the standard of care in the North East has not been compromised by the challenges presented by increasing numbers of people coming through our hospitals. Today’s figures do not include intermediate care beds, however, there are now 700 intermediate care beds in Scotland which support older people and those preparing to leave hospital – 200 of which have been created this year. Banffshire & Buchan Coast MSP Stewart Stevenson has congratulated the winner of the Buckie by-election, SNP candidate Sonya Warren, on her election. “I am delighted Sonya Warren has been elected to succeed well-respected local councillor Joe Mackay. I am sure she will be an excellent servant for the community. "I fought this election in Buckie because I am passionate about my community and I will be a strong advocate for Buckie in Moray's Council Chamber. "I thank the voters of Buckie Ward for their huge support in this election and the many people who helped me throughout my campaign. "I am delighted to be joining an SNP Council Group in Moray that has fought to protect our schools, that supports our local town centres and that recognises the importance of investing in key assets like Buckie Harbour. "The hard work of the campaign is now over and the hard work as a Buckie councillor begins." Stewart Stevenson, SNP MSP for Banffshire & Buchan Coast, has raised a glass to International Whisk(e)y Day today (Friday) and praised the work of the distilleries in his constituency who promote the premium product. Glenglassaugh Distillery, Knockdhu Distillery and Macduff Distillery in the Banffshire and Buchan Coast produce some of the country’s finest whiskies. International Whisk(e)y Day was started by Nouet and Helen Arthur as a way to honour their friend and legendary whisky writer, the late Michael Jackson. As well as celebrating whisky, fans are encouraged to donate money to charities of their choice – most commonly Parkinson’s Disease charities as Michael suffered from this for many years. Stewart Stevenson, SNP MSP for Banffshire & Buchan Coast, wore a purple ribbon in the Scottish Parliament today (Thursday) to mark International Purple Day while hundreds of Epilepsy Scotland supporters organised events across Scotland. Epilepsy is defined as repeated seizures that start in the brain. A brief disturbance in the brain's normal electrical activity causes the nerve cells to fire off random signals, and the result is like an electrical storm that causes a temporary overload in the brain. Epilepsy is the most common, serious neurological disorder in the world. Following the recent election of Travis Beattie to represent Banffshire and Buchan Coast at the Scottish Youth Parliament, local MSP Stewart Stevenson praised the level of post-Referendum youth engagement and encouraged it to continue. He was joined by Christian Allard, MSP for the North East who submitted a motion to the Scottish Parliament to congratulate the winners on their success. The Scottish Youth Parliament is the democratically elected voice of Scotland’s young people. Members of the Scottish Youth Parliament (MSYP) are committed to ensuring young people are heard by the decision makers of Scotland and to campaign on issues which matter most to Scotland’s youth. Seventeen MSYPs have been elected to represent the North East of Scotland following elections which took place during March. Mr Stevenson and Mr Allard both praised MSYPs for their role at the forefront of youth engagement in the North East. “Last year’s Referendum and the lowering of the voting age for it engaged a whole new generation of voters with the political process and I’ve been delighted with how that has carried on post-Referendum. “It is fantastic to see so many youngsters across the North East so politically engaged. “There were plenty of candidates that stood for election at the Scottish Youth Parliament – well done to all those who participated and to those who were successful. Stewart Stevenson, SNP MSP for Banffshire & Buchan Coast, has called for consideration of a 10mph reduction in speed limits across Scotland as a way to combat climate change. WWF Earth Hour takes place for an hour at 8.30pm on Saturday 28th March where many public buildings will switch off their lights to highlight the need for action on climate change. In Mr Stevenson’s constituency, town clocks in Buckie and in Cullen are taking part as well as Aberdeenshire and Moray Councils. “Climate change causes very significant problems for real people. It will lead to mass migration and deaths. It is not simply an academic argument. Mr Stevenson will promote WWF’s Earth Hour this Saturday as quizmaster of the WWF Candlelit Quiz at the Crowne Plaza Hotel next to the SECC in Glasgow at 8.30pm. 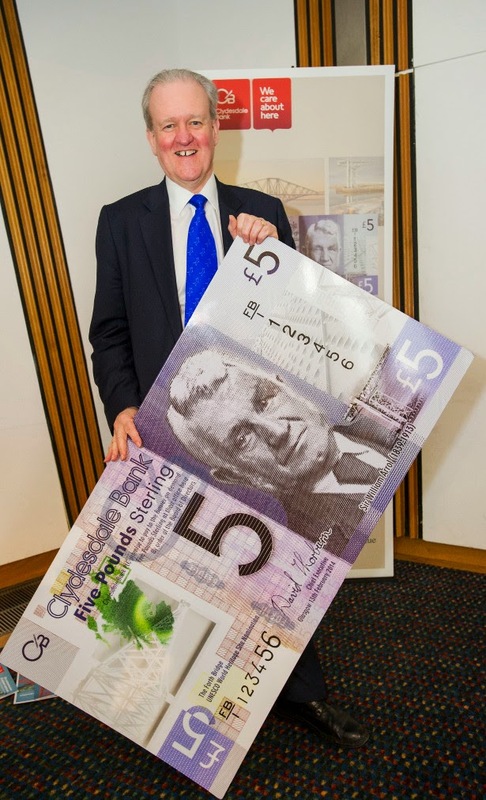 Stewart Stevenson, SNP MSP for Banffshire & Buchan Coast, is delighted that the Clydesdale Bank in Scotland is issuing its first polymer banknote a year before the Bank of England. The limited edition £5 note is the first of its kind to enter circulation in Great Britain, and Clydesdale Bank plan to issue two million of the new banknotes. The new Clydesdale plastic note features an image of the Forth Bridge and has been issued to commemorate the bridge's 125th anniversary. It also features a portrait of Sir William Arrol, whose company constructed the bridge among many other landmarks in Scotland. More than 20 countries around the world have adopted polymer notes. In 1999, Northern Bank of Northern Ireland issued a polymer £5 commemorative note celebrating the year 2000. A plastic note was introduced in the Isle of Man in 1983 but was withdrawn in 1988 owing to problems with the ink. 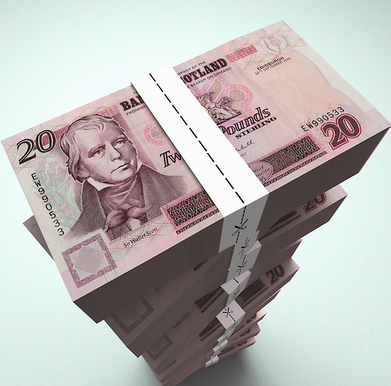 Limited edition notes will be available from branches of the Clydesdale. In the first major review of the legislative process since the Parliament was established, the Committee has called for a number of changes to make the system more open and easier to understand. Changes include making the documents accompanying draft bills clearer and extending the timescales between some stages of the legislative process. “This inquiry was about making sure that what we do as a Parliament is open and accessible for those we represent. We heard that the legislative process can be difficult and confusing to follow. Our inquiry was about what more could be done so people from all walks of life could become engaged in shaping the laws of Scotland. Better information must be available about the timetables for bills. Improving guidance on amendments to help people engage with the process at stages 2 and 3. Down’s Syndrome Scotland, which supports people with Down’s syndrome, their families and professionals, organised an exhibition for MSPs at the Scottish Parliament to highlight Down’s Syndrome Awareness Week (16th-22nd March 2015) and the United Nations World Down’s Syndrome Day (Saturday 21st March 2015). 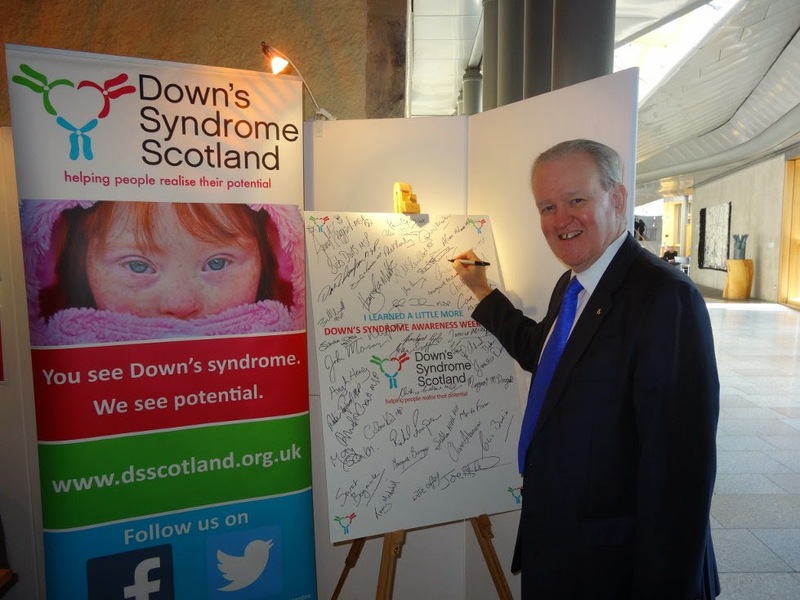 Banffshire & Buchan Coast MSP Stewart Stevenson welcomed the opportunity to learn a little more about Down’s syndrome to better represent and help constituents. 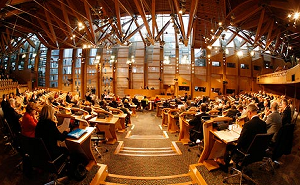 The event gave MSPs a chance to obtain information on the condition and the importance of communication skills for people with Down’s Syndrome in Scotland. “Children with Ds and their parents need continuous support with speech and language therapy. Better communication not only helps children and parents to bond but it also helps children and teenagers with Ds to perform better at school and develop friendships. “Being able to communicate also improves the chances of all adults with Ds to maintain a good quality of life and maintain wellbeing. We know that by age 40, people with Ds have an increased risk of developing dementia. Communications skills should therefore be at the core of delivering person-centred care. “Through our work we have gathered evidence on the benefits of running communication groups for children with Down’s syndrome and their parents. To get it right for every child with Ds, greater recognition and resources should be given to improving communication skills across the country. In a Scottish Parliament debate yesterday (Tuesday) Stewart Stevenson, SNP MSP for Banffshire & Buchan Coast, highlighted his support for average-speed cameras on the A9 and criticised those against the traffic calming measure. Mr Stevenson said that the cameras, which have been in operation for the past few months, had changed behaviour and reduced law breaking, with evidence so far suggesting that the number of accidents with people killed and seriously injured has reduced. Mr Stevenson welcomed improvements to the A9 including its dualling all the way up to Inverness, but added that not all problems would be solved by changing the road. Stewart Stevenson, SNP MSP for Banffshire & Buchan Coast, has emphasised the importance of language skills and how they can create a higher profile for the North East. In a Portfolio Question today (Wednesday), Mr Stevenson asked what action was being taken in the North East to help develop language skills that will bring more international business to the area. “Our commitment to stronger languages provision in schools is fundamentally linked to our ambitions for business growth throughout Scotland. Stewart Stevenson, SNP MSP for Banffshire & Buchan Coast, has welcomed the Scottish Government’s increase in funding to Aberdeenshire and Moray councils as a further demonstration of the SNP’s commitment to his constituency. The Local Government Finance Order agreed by Parliament on Thursday delivers an additional £107m to local government in Scotland – and shows that the budget allocated to Aberdeenshire Council has risen from £406.050 million in 2014/15 to £414.723 million in 2015/16, and to Moray Council from £154.552 million to £160.328 million over the same time frame. This package includes funding to maintain the council tax freeze for another year, maintain teacher numbers at 2014/15 levels, to mitigate the Bedroom Tax and to provide free school meals for children in P1-3. “This latest funding boost from the Scottish Government will be welcomed by people across Aberdeenshire and Moray and is another example of the SNP’s commitment to investment in our vital public services. “The SNP in government is providing a fair deal for local government and is delivering on key policies benefiting local people – from the council tax freeze which is protecting family budgets during tough economic times to free school meals to give our youngest pupils the best possible start in life. “This funding will also see the number of teachers in Aberdeenshire and Moray maintained at current levels – and will keep people across my constituency protected against the imposition of Westminster’s Bedroom Tax. Stewart Stevenson, SNP MSP for Banffshire & Buchan Coast, demonstrated his support of local and national libraries in a Scottish Parliament debate yesterday (Thursday) on the importance of the public service they provide. 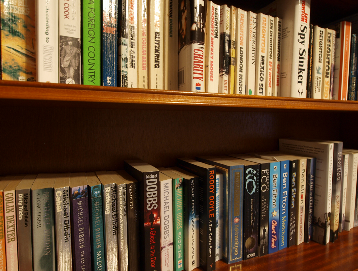 Books can be targets in any conflict and Mr Stevenson mentioned the invading Japanese destroying more than a million books and documents in China during WWII, and the Nazi book burnings in the 1930s. Mr Stevenson praised the local libraries in Buckie and Fraserburgh where he holds regular surgeries and the National Library of Scotland as an invaluable resource for his interest in genealogy. Stewart Stevenson, SNP MSP for Banffshire & Buchan Coast, has welcomed an £8000 Awards for All grant awarded to Buchan Archers this week. The funding will be used to buy the necessary equipment to set up a new archery club. 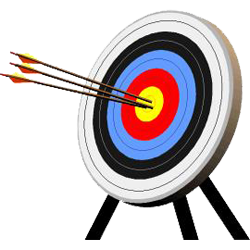 Buchan Archers are just one of 66 groups across Scotland sharing in in £493,237 from Awards For All Scotland this week. Stewart Stevenson, SNP MSP for Banffshire & Buchan Coast, has welcomed an approval of plain tobacco packaging by the UK Government this week. The Scottish Parliament had already agreed that the legislation would apply in Scotland if approved at a UK level. “I fully support the Scottish Government’s aim to create a tobacco-free generation in Scotland by 2034, and this is one of the things that can be done to make this happen. 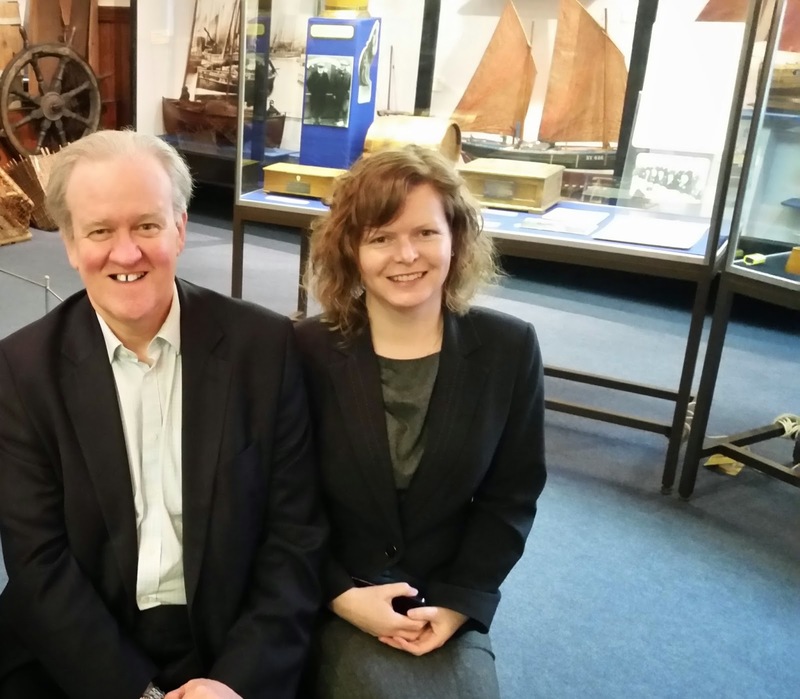 On Friday, 6 March 2015, Stewart Stevenson MSP for Banffshire & Buchan Coast and Morag Macpherson, Head of Research and Development at Museums Galleries Scotland (MGS) visited Arbuthnot Museum as part of a series of MSP visits to museums, proposed by MGS, to engage them in championing their local museums and experiencing first-hand their achievements and challenges. "Our local museums play a tremendously important role as the custodians of our civic heritage, but should also be places of fun and learning where younger generations engage with their history. "I've heard some very good reports about engagement and outreach work carried out by the local museums service; Mr Arbuthnot's Cabinet of Curiosities comes to mind as a recent example. At the same time, we should never lose sight of the importance of collections such as the Shivas photographic plates, which I was shown today, as a link with the past." “It has never been more important for museums and galleries to showcase how they’re delivering across health and wellbeing, education and social agendas in a cost-effective, convincing and comprehensive manner. MGS will be visiting other museums and galleries with MSPs over the next couple of months. The publication of a new strategy for supporting veterans in Scotland has been welcomed today as a positive step forwards. 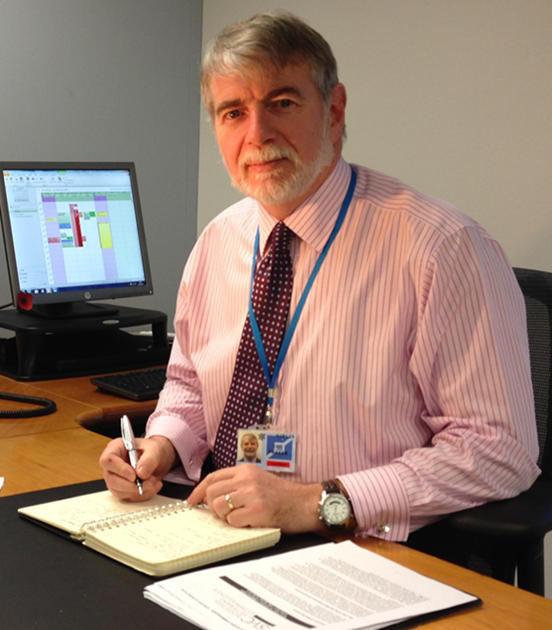 The post of Scottish Veterans Commissioner was established in 2014 to deliver improved support for veterans in Scotland and the publication of today’s strategy sets out the work that the Commissioner will undertake. The answer to the Parliamentary Question setting out the strategy also makes clear that housing and employability issues will be prioritised by the Commissioner in 2015. “The publication of this strategy is a positive step towards improving the support that is offered to veterans in Scotland. “Making sure that former members of the armed forces get the support and assistance that they deserve is so important and this strategy shows that the Scottish Veterans Commissioner is determined to make a real difference. “The SNP Government has been determined to provide greater support to the estimated 400,000 ex-service men and women in Scotland, with measures like extending the free bus pass to injured veterans. Stewart Stevenson, SNP MSP for Banffshire & Buchan Coast, lent his support to Marie Curie’s Great Daffodil Appeal this week by sporting a yellow daffodil and visiting their exhibition at the Scottish Parliament. 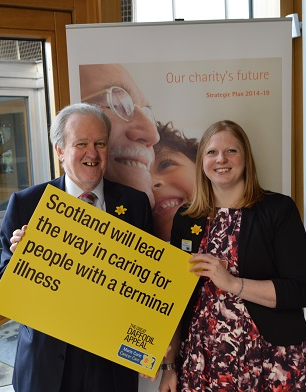 Mr Stevenson met staff and heard about the work of the charity that cares for terminally ill people and their families across Scotland, before posing with a placard pledging support for people with a terminal illness. “Everybody is related to or knows of someone that has been given a terminal diagnosis and realises how devastating this can be. The service that Marie Curie provides in caring for people in their own homes and in their Scottish hospices in Edinburgh and Glasgow is wonderful. More than 200 Marie Curie Nursing team members work in Scotland, caring for around 4800 terminally ill people and their families at home each year. The hospices in Edinburgh and Glasgow care for around 2600 people annually. “It’s thanks to the support of MSPs such as Stewart we can spread the word about the Great Daffodil Appeal and raise vital funds to support terminally ill people in Scotland. Every March millions of people across the UK support our biggest fundraising campaign and it’s easy to join in, simply give a donation and wear your daffodil pin. Marie Curie is also a leader in research into the best ways of caring for people with a terminal illness. Around 70 per cent of the charity’s income comes from donations with the balance of funds coming from the NHS. Measures to improve the transparency of information about MSPs' financial interests are today (6 March) being proposed by the Scottish Parliament’s Standards Procedures and Public Appointments Committee. In its report, the result of a detailed inquiry conducted over a number of months, the Committee proposes a committee bill to amend the Interests of Members of the Scottish Parliament Act 2006 which sets out requirements for Members to register and declare certain financial interests. The new bill is aimed at streamlining the reporting requirements for MSPs so that all their registrable financial interests are reported in one place, in the Parliament’s register of interest. Currently MSPs have to report financial interests both to the Electoral Commission and to the Parliament. The proposals would also strengthen the sanctions available to the Parliament to deal with breaches to Member’s interests rules as well as widening the definition of paid advocacy. “The Scottish Parliament prides itself on its openness and accountability and nowhere is this more important than in relation to the conduct of its Members. Our proposed bill will not only build on the existing robust regime, but will also streamline reporting for MSPs, ensuring all information about MSPs’ financial interests is in one easily accessible place for the public. Amending the threshold for registering remuneration received solely as expenses from 1% to 0.5% of a member’s salary. Increasing the range of sanctions available if a member breaches the Interests Act, to include withdrawal of salary or privileges as well as exclusion from Parliamentary proceedings. He paid tribute to the Mary Slessor Foundation which supports her memory and is dedicated to improving the lives of people in Nigeria. The announcement of an extra £400,295 for Aberdeenshire to deliver programmes that help to employ young people has been warmly welcomed by Stewart Stevenson, SNP MSP for Banffshire & Buchan Coast today (Tuesday). Aberdeenshire will use the funding to support the implementation of recommendations made by the Commission for Developing Scotland’s Young Workforce in their blueprint published last year. Recent labour market statistics show that youth unemployment in Scotland has fallen to its lowest level in five years, while youth employment has risen over the last year. “The announcement of £400,295 to allow Aberdeenshire to do more to help reduce unemployment amongst young people in the area is great news. “We have made huge progress in Scotland in tackling youth unemployment, but there can never be any room for complacency when young people still struggle to find work. “The Scottish Government is doing all that it can to boost employment with the powers currently available to it, but with greater responsibilities over tax and welfare we could do even more.